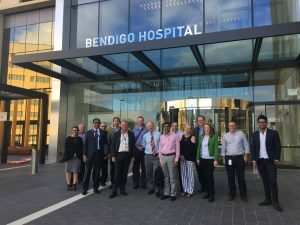 The digital health community was keen to see first-hand the technology driving Bendigo Health’s push to a full digital hospital. Two guided tours were held last month with attendees walked through emergency department and an inpatient ward to see the technology used. The groups also heard from Executive Director Acute Health, Bendigo Health, Robyn Lindsay on her approach to clinical chang e in a digital hospital. Bruce Winzar (Bendigo Health CIO) and Danny Lindrea (Bendigo Health ICT Director) also spoke on the story of Bendigo Health’s transition to a digital hospital. * ACADEMIC INSTITUTIONAL MEMBERSHIP eligibility criteria: AIM is for tertiary institutions that have health informatics programs or courses (teaching and/or research) – does not need to be specifically named HI course, e.g. public health, health information management etc. is ok. Provides HISA memberships for all faculty and higher degree by research students (Masters by Research or PhD students). Introducing the Health CXIO Network! The CXIO Network aims to provide a common platform for clinical leaders in digital health to share information – from innovations to emerging clinical issues and solutions – in order to deliver improved patient care. HISA and HIMAA have recommended health informatics and health information management expertise is present at all levels of governance within a proposed Australian Commission for Electronic Health (ACeH). This publication is the second volume in HISA’s Thought Leadership Series. It represents a compilation of the content presented at the conference, as well as themes raised in discussions and networking. We thank Nigel Chartres who has authored this report and all presenters and attendees who contributed directly and indirectly to the content. This publication is the inaugural volume in HISA’s Thought Leadership Series. It represents a compilation of the content presented and the discussions held at Data Governance 2011. We thank Nigel Chartres who has authored this report and all presenters and attendees who contributed directly and indirectly to the content. This position statement has been developed to recognise the pivotal role of nurses in the widespread implementation and adoption of digital health technologies throughout the healthcare sector for the primary purpose of improving safety and quality of patient care. The successful planning, implementation, management and sustainability of such technologies cannot be achieved without the unique contribution of nurses. The competencies set the minimum requirements in terms of skills, knowledge, understandings and capabilities that will enable a candidate to perform in a professional environment. The competencies serve to define what health informatics professionals know and do. This framework can also be used as a set of guidelines for recruiting purposes, definitions of career pathways, or the design of educational and training activities. They provide the context in which the questions for the CHIA exam have been developed. The Guidelines serves as a resource to assist the health sector as a whole, and especially healthcare professionals, to protect the personal health information (PHI) they require to do their work, and to meet their role and responsibilities. Will your digital health implementation be a success story? How will you make sure your digital health implementation is safe? The Australian eSafety Professional Practice Guidelines are being released for trial implementation initially, as it is important to acknowledge that patient safety in relation to digital health systems is a topic that continues to evolve, with a growing evidence base and emerging best practices being applied in a number of countries and jurisdictions. The guidelines are the first publication specifically tailored for the Australian digital health sector. A comprehensive body of knowledge that focuses explicitly on the needs of practitioners in the field of health informatics in Australia. It also covers the competencies tested in the CHIA exam; a valuable asset for CHIA candidates. The Practitioner’s Guide has also been developed with other purposes in mind, including orientation for professionals such as clinicians or ICT professionals new to health informatics and updates for health informaticians wishing to maintain the currency of their knowledge, irrespective of certification. If you purchased the first edition of A Practitioner’s Guide to Health Informatics in Australia, please email [email protected] for a special price to purchase the second edition. In the issue of the Medical Journal of Australia published just prior to the November 2007 election, a number of commentators including the Federal Minister and Shadow Minister reflected on the Australian health system and their plans for its future. The members of the Health Informatics Society of Australia (HISA) believe there is a yawning gap in this analysis both in terms of the size of the problem and how it might be fixed. On behalf of Australia’s digital health community, HISA commends this submission to the Sustainable Health Review Panel, and wish them well in their deliberations. Our Board and members would welcome further involvement in the review process, either within the Panel’s current terms of reference or beyond. The Health Informatics Society of Australia (HISA) made a proposal to the E-Health Branch of the Australian Department of Health and Ageing (DoHA) that a review of the health informatics workforce be undertaken and were subsequently contracted to „prepare a background discussion paper which sets out the scope and structure of the health informatics workforce and draw together a summary of the key issues, gaps and opportunities for further work to be undertaken on this issue’. This then is a scoping study. The Australian Healthcare and Hospitals Association (AHHA) has convened three groups of experts, clinicians and academics to develop practical policy options across a range of areas. Australian Government Budget 2008-09 Summary of e-Health and health information measures. Late 2006 CQU established the electronic Journal of Health Informatics (eJHI) with a large international editorial board. Affiliate membership is an introductory membership available only for new members to HISA and not available for existing or previous HISA members. Affiliate membership is a great way to get to know the organisation with a limited number of benefits. This membership is available for a maximum of 2 years for an individual. * HISA + ACHI COMBINED MEMBERSHIP. Membership is assessed by ACHI. MACHI – granted to individuals who have a recognised level of achievement within the health informatics discipline. Post-nominals of MACHI are awarded. Must complete MACHI application form. FACHI – granted to individuals who have made a substantial achievement and contribution within the health informatics discipline. Post-nominals of FACHI are awarded. Must complete FACHI application form. Student: Must provide proof of full-time enrolment. Concession: Members must hold a government health care card and provide a valid copy upon registration. Retired: Retirees who have been ordinary members for the past 2 years. No voting rights & cannot be elected onto the board or committees.